A student makes a purchase at the bookstore during E period on Dec. 5. The spirit shop/bookstore, a constant and dependable source of pencils, composition books and Pop-Tarts, shifts its focus around Christmas. 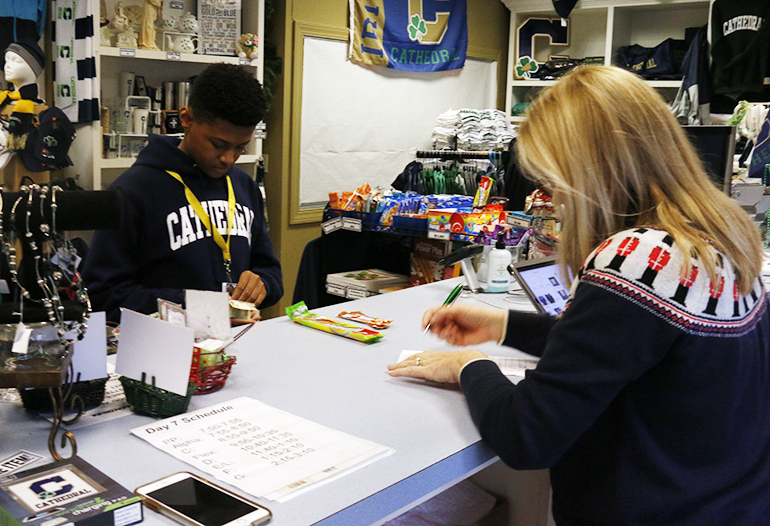 Due to Rogozinski‘s efforts in managing the inventory, making advertising gift baskets and providing customer service, the Spirit Shop has become an excellent place for current students, teachers, alumni and prospective parents to buy Christmas gifts, she said. The spirit shop inventory changes seasonally. However, December is a high traffic month, according to Rogozinski. To account for the large influx of business brought on by Christmas season, Rogozinski said, “I begin (planning for Christmas in) October, increasing our inventory and bringing in new items. We bring in more stock so we can readily replenish popular items.” The most trendy items are Cathedral sweatshirts and pullovers, which are especially popular among the girls.